The only movie in the history of the world to have all its music performed by AC/DC. Little Leaguers massacred for no reason. Gratuitous version of "King of the Road." Two and a half stars [Joe Bob gave it 3 stars when it first came out in his Universal Press Syndicate column]. "Maximum Overdrive." Check it out. I'll be here all night to help you with it. Go. [fading] I hope Valvoline knows what they got into when they sponsored this one. They WILL have a very fine-tuned demographic by the time it's over, though. Let's see, it'll be one bored hospital security guard. A gal who wants to have Emilio Estevez's baby. Oh, and a bunch of guys in prison. THEY use a lot of motor oil. 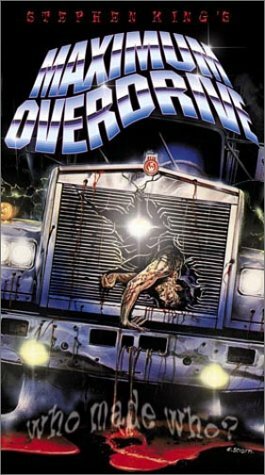 You know, no matter how many times I make fun of "Maximum Overdrive," Big Steve still speaks to me. He invited me to his big 25th anniversary party, celebrating the publication of Carrie. Steve, you're a bigger man than I. That's what happens in middle age. You could really lose 20 pounds, guy.... There won't be any more invitations, will there? Did you see her? It was Marla Maples, being bombarded by flying watermelons, in her famous role as "Woman #2" in "Maximum Overdrive." Remember when she first started dating The Donald? Or whatever you call it they were doing--I guess it's not dating if the guy is married to somebody else--anyway, when they first started rootin around, the newspapers would report on her as a "mysterious actress." Now we have evidence that she had indeed emoted on film. And a dang fine job she did, too. Okay, let's keep on with it, it doesn't start to drag for another couple commercials. Roll it. [fading] How much do you think Marla got in that divorce? It wasn't that much. It was in the low eight figures. She didn't really need it. She's got one of those K-Mart clothing lines, right? Very lucrative. Or is it acid-wash jeans? No, that was Donna Rice. Well, we got a WHOLE lotta subplots going on here. We got the redneck truck stop owner, played by Pat Hingle. We got Emilio Estevez wandering around aimlessly. We got the honeymooning couple careening around the countryside. That's Yeardley Smith, by the way, as the bride, the one who says "Curtis, are you dead?" She's best known today as the voice of Lisa Simpson on "The Simpsons," but in 1986 she had just starred on Broadway in "The Real Thing," directed by Mike Nichols. Let's see, what else? We've got the waitress who gets cut by the runaway electric carving knife. We've got the yahoo gas station attendant who gets a face full of gasoline right square in the eyes. We've got the little kid riding around on his bike. And we've got a bunch of 18-wheelers that are supposed to be terrifying, but mostly they're just kinda lame. What I'm wondering is why Emilio Estevez did this movie. The guy's 23 years old, and his list of films goes like this. "Tex." "The Outsiders." The Breakfast Club. "St. Elmo's Fire." "That Was Then, This Is Now," which was made from his own screenplay. And then . . . "Maximum Overdrive." And while he was making "Maximum Overdrive," he was already getting ready to write, direct and star in "Wisdom." We're talking one of the hottest actors in the world at this point, and he's doing dialogue with motor vehicles. There's a LITTLE bit of a possibility of some actual drama here, between Emilio and Laura Harrington, the pretty hitchhiker. She was known at this point for working with Al Pacino on Broadway, when he did "Richard III," and for starring in a little independent movie called "City Girl." So let's see how this develops. Roll it. [fading] Emilio Estevez is the nephew of Joe Estevez, the obscure black-sheep B-movie Estevez, but Emilio Estevez's FATHER is Martin Sheen, whose real name is Estevez but he changed it, and Emilio Estevez's little brother is Charlie Sheen, who took his father's name just to be different and confusing. Only now he goes by CHARLES Sheen. You know who else did that? Debbie Gibson. Now goes by DEBORAH Gibson. Like we're not gonna recognize em or somethin. Course, I admit, when I start doing more serious things, I plan on using my given name, too. Joseph Bob Briggs. It always bothered my daddy that I didn't use my formal name. I was named after him. He was Robert Bob Briggs. "Oh, honey, you're bleeding like a stuck pig!" Only one of the many great lines for Yeardley Smith in this movie. That obnoxious voice is very funny. But as the Mack trucks go on the rampage at the Dixie Boy truck stop, wasting everything in sight, this might be a good time to welcome the lovely TNT Mail Girl, [enters] Rusty, who is here once again with letters from our captive audience in the fine penal institutions of America, in what we call "Joe Bob's Jail Break." You know, Yeardley Smith is the voice of Lisa Simpson. MAIL GIRL: I've actually never seen "The Simpsons." MAIL GIRL: I'm kinda busy on Sunday nights. Every Sunday for ten years? MAIL GIRL: Let's say I have a class. What do you mean, "Let's SAY I have a class"? Do you have a class, or don't you? MAIL GIRL: Well, it's with a professor, and I learn a lot. Am I the only one who hasn't had a date with you? MAIL GIRL: No! But I did go through a period where I was very . . . popular. Uh huh. I wish you were that "popular" with me. MAIL GIRL: Here's a letter from Bubba Hopkins at the South Dakota State Penitentiary in Sioux Falls. "You are a big hit here at the South Dakota State Penitentiary, but considering our chow hall's board of fare, anything is an improvement. Nowhere else can you find the cheesiest films but on your show. "By the way, there's another film I rented called 'Dr. Jeckyl's Dungeon of Death.' This is just fantastic because they seem to have done the whole movie on a budget of about $20 . . . and most of THAT went for BEER!! You might want to show that one on your show sometime. In fact, you could show em both for a double-dip. There's enough cheese in those two films that all you need is the dried hunks o bread and you'd have a fondue. "Finally, I would appreciate it if you'd send an autographed picture. I'll put it right next to my 'Montana is 4 Lovers' poster with the smiling rancher and the terrified sheep. "p.s. - My cellmate Kevin says 'Howdy'! "p.p.s. - Need more Godzilla Flicks"
How can a guy in the joint find movies that I can't even find? Preciate the support, Bubba. I'll look out for those titles. I might have to go up to South Dakota and check out your Sunday service. Do the Presleyterians have confession? Cause if they do, there must be quite a line for the booths at this congregation. South Dakota State Penitentiary is the oldest prison in South Dakota, opened December 12th, 1882. 2400 inmates, about a tenth of em are women. Which may account for the fancy French rococo fountain with the plaster swans out front. Do we have a picture of that? Interesting touch for a maximum-security pen. Okay, Bubba, free their minds and their butts will follow. So, Rusty. This "professor" of yours--what does he teach? MAIL GIRL: What?! You should try it some time. Girls LOVE poetry. Honey, you don't have four ex-wives and not hear THAT 300 times. MAIL GIRL: [exits] You don't want to take my advice, don't take my advice. Wait a minute--did you mean try it with YOU? Shall I compare thee to a summer's day? Rusty? MAIL GIRL: [re-entering] I thought you only had three ex-wives. Oh, yeah, I was counting one of the ones I lived with. Rusty? Shall I compare thee to a perfect potential future ex-wife? The fourth time with thee wouldst be a charm. Well, we're about an hour into it now, and it just flat dropped its transmission. You know why? Because Stephen King tried to direct ... A LOVE SCENE! Think about it. Everything was fine up to that point, right? I mean, we got the machines taking over the world. We got the bank sign flashing the f-word--which you did NOT see on TNT, because we can't show the f-word on TNT. We got the drawbridge scene, where ten, fifteen motor vehicles get destroyed. We got the maniac cigarette machine, the attack diesel pump, the leaping electric carving knife, Coke-can brain surgery. We've got exploding 18-wheeler aliens. We've got Pat Hingle running around shooting off a bazooka he happens to keep in the basement. Then what happens? Emilio Estevez and Laura Harrington do this pathetic little kissing scene, and then they start making the sign of the four-legged spouting walrus, and you know what that adds up to? A Perry Como music video. See, Steve knew this going in. Dino DeLaurentiis asked him to direct one of his movies, for two reasons. One, Big Steve had always been upset that most of the screen versions of his books turned out wrong. He didn't even like The Shining--and EVERYBODY likes "The Shining." Plus at this time, his movies had such a bad reputation in the industry that, when "Misery" came out, the studio tried to DISGUISE the fact that it was written by Stephen King. Dino DeLaurentiis had produced four Stephen King films, none of which did very well--The Dead Zone, "Firestarter," "Cat's Eye" and Silver Bullet. So Dino thought he'd get a better result if Steve did the directing himself, and Steve said, okay, but the story he wanted to do was "Trucks," one of the earliest stories he ever wrote, back when he was a nobody living in a rented trailer somewhere in Maine. And the reason was that he felt comfortable dealing with machines and explosions and that kind of stuff, but he had a mortal fear of having to talk to actors about "The Method" and "motivation" and stuff like that. And so he just let the actors kinda wander around and he spent all his time directing the trucks and the machines. And that's how "Maximum Overdrive" ended up sucking. Even Steve admits it. But the flick does have its moments. So let's continue with it now. Go. [fading] You know what we did NOT see? I just realized it. We didn't see Stephen King's own cameo in the film. Where he goes to the automatic teller machine, tries to get cash, and the machine says "You're an --" I can't say what the machine says. Seven letters, rhymes with lasso. This movie had so much cussing in it that half of it was gone by the time they butchered it down for cable. You know what that makes me think? Maybe Steve's original version, before it got censored, is a REALLY GOOD movie... Maybe not. What's a "road twitch"? Is that what she said at the end of that last scene? "Just a little lesson in manners from the road twitch." I'm sure that's what she said. It MIGHT be more of the TNT censors monkeying around with the dialogue. Because this movie originally got an X rating. For excessive gore and for bad language. Stephen King's original idea was to make it raw and vulgar and hard-driving, which is why he chose AC/DC for the soundtrack. But most of his great splatter effects had to come out. Like, remember the scene at the beginning where the steamroller goes wild on the Little League field? Well, one day they were setting up the shot where the steamroller mows down one of the Little Leaguers, and they had a dummy all set to be flattened. And at the last minute, Steve said to the special effects guy, "Gimme one of those blood bags." And they went over and put a blood bag on the body. He was hoping that after the steamroller finished running over the body, there would be this great dramatic streak of blood on the equipment. But what it did instead is that it made it look like the kid's head exploded. So Steve was so happy with the footage that he called up his friend George Romero, director of Night of the Living Dead, and he sent him a video of the footage, and Romero got sick watching it. He had to look away. And so Steve was very proud of himself. But the MPAA ratings board was not impressed. They told him to take that out, along with a couple other gore effects, and tone the whole thing down, or else he didn't have a chance of getting an R rating. So all the good stuff had to come out. I think I should be on the ratings board, then we'd get some decent movies made. Okay, I'll shut up now, because I know you're dying to get back to the story--all three of you. Roll it. [fading] AC/DC. Official band of the San Diego Padres. And Butthead. No, Beavis. Only Beavis wears the AC/DC T-shirt. Who wears the AC/DC T-shirt, Beavis or Butthead? That show's only been off the air for about a year now. I say Beavis. You know, if you were in a bar in Atlantic City and everybody was really really drunk, and you pretended not to know the answer to that question, you could make a BIG pile of money. Why is Emilio Estevez limping? And what did he just mumble about a "broom"? He's wasted from . . . pumping too much gas? Operating too many nozzles? You know, just when you think this unbelievable movie reaches a new level of unbelievability, it tops itself--or bottoms itself. The machine-gun turret that holds everyone hostage, and talks to the truck stop in Morse Code--I would say that's pretty much as far as you can go with this concept, wouldn't you? Fortunately, it's ALMOST over. What's amazing to me is that Stephen King could have chosen ANY story, of all the hundreds he's written, to be his first directing effort. And he chooses this weird one that he sold for 250 bucks back in the early seventies. Wouldn't you think he'd have a great one tucked away just for this moment, instead of givin it to Rob Reiner? Okay, now for the stunning conclusion to "Maximum Overdrive." [fading] Wait! I believe it's time! Yes, it is! It's time for Emilio Estevez to EXPLAIN the whole plot of the movie in a big speech that begins with the line "Imagine you're a race of aliens, right?" You don't believe me. Watch. Lemme get this straight. The whole secret of survival was to jump onto a sailboat? And everybody cheers--even though Brad just got flattened like a pancake by a grinning 18-wheeler full of toys. If all they had to do was run into the woods and jump on a boat, why didn't they do it in the first 20 minutes of the movie and save us a WHOLE lot of bad dialogue. Like "You can't do this! We made you!" Wanda June the waitress, in her big emotional scene. All right, I musta been a bad boy, cause next week I've been saddled with Look Who's Talking Too again, followed by the Christopher Lambert sword-fighting cult favorite, Highlander. I'm Joe Bob Briggs, reminding you that when the chips are down, the buffalo is empty. Did you guys hear the one about the blonde who's trying to sell her old car? She's having a lot of difficulty, because the car has 250,000 miles on it. One day, she tells her problem to a Newfoundlander she works with at a salon. That's right, I said "a Newfoundlander." You're about to hear what may be the world's ONLY Newfoundlander joke. The Newfoundlander tells her, "There is a way to make the car easier to sell, but it's not legal." The blonde says, "That doesn't matter if I can sell the car." So the Newfoundlander says, "Okay, here's the address of a friend of mine. He owns a car repair shop. Tell him I sent you and he'll turn the counter in your car back to 50,000 miles. Then you shouldn't have a problem selling it." The next weekend, the blonde makes the trip to the mechanic. About a month after that, the Newfoundlander asks her if she's sold her car. The blonde says, "Why should I? It only has 50,000 miles on it." [fading] A blonde calls the police to report that thieves have been in her car. She tells em, "They've stolen the dashboard, the steering wheel, the brake pedal, even the accelerator!" But before the police can start investigating it, the phone rings again. It's the blonde--tells the police, "Never mind, I got in the back seat by mistake." When there's no more room in the ocean, the trout will walk the Earth. Dear Duchess: We already have quite a few people that look like carp running around out here. Millions of People are Going to Be Tormented Day and Night For Ever and Ever. The third angel followed them, saying with a loud voice, "If any man worship the beast and his image, and receive his mark in his forehead, or in his hand, the same shall drink of the wine of the wrath of God, which is poured out without mixture into the cup of His indignation; and he shall be tormented with fire and brimstone in the presence of the holy angels, and in the presence of the Lamb; and the smoke of their torment ascends up for ever and ever; and they have no rest day nor night, who worship the beast and his image, and whosoever receives the mark of his name." Rev. 14:9, 10, 11. After you have thoughtfully read this in its entirety; please hand it to a friend. Dear J.A. : I'll hand it to my friend as soon as he gets back from prayin' to a buffalo. Or above for the music-video "Who made who?" Stephen King says that when people ask him where he gets his ideas, he replies, "Utica." �1999 Turner Network Television. A Time Warner Company. All Rights Reserved. Legal/Privacy Notice about this site.